Recently, I have been studying a frequently misunderstood Dharma concept, that of renouncement, (Sanskrit; Sannyasa). It is not, as some seem to think, a mandate at any stage of life, although as people age it seems to come naturally. Actually, material renouncement is not exactly the same as sannyasa but it is the first step. Most of us could use a bit of renouncement at any age, as was brought to my attention by my daughter as she explained to me after a rigorous “material cleansing” of what seemed to me to be most of her worldly goods. Several years ago I had the procrastinated task of cleaning out a storage locker that I had rented for far too long. It contained stuff – lots and lots of stuff – that had once been highly coveted items. Some of the items I needed and was glad to retrieve. There were my snow skis, which I had dearly missed, trinkets, mementos, and cutting-edge electrical gadgets (or at least they were when I stored them). As I toiled about in the hot sun, packing my truck and trying to separate what I intended to go to charity from that which I intended to keep, I couldn’t help but get frustrated about all of the boxes I had that were filled with – stuff. 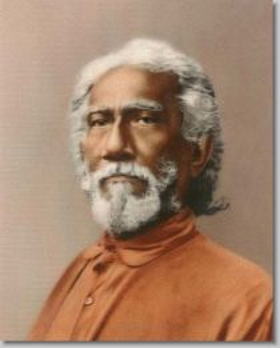 Sri Yukteswar Giri the monastic name of Priya Nath Karar, guru of Satyananda Giri and Paramahansa Yogananda. He was a Kriya yogi, a Jyotisha, a scholar of the Bhagavad Gita and the Bible, an educator and an astronomer. There were two boxes of kitchen utensils. Gee, I didn’t realize I even owned that many kitchen utensils. Many towels, auto parts, souvenirs, old magazines and receipts for bills long since paid, were among what now was just clutter.I found a computer monitor with which I never thought I’d want to part. However as I surveyed my truck for space I began to prioritize differently. The storage place is about 150 miles from where l was then living. The things had been there about 5 years, and during that time the size of monitors has decreased, the scanner I had so carefully packed was a standalone which has been replaced by my printer that scans, photo copies and oh yes, it prints too. The VCR has been replaced by TiVo and CD players. I can no longer squeeze my expanding middle into some of the pants and whatever did I nsave these boots for? As I packed some and discarded some, the lady who worked at the storage place came over to chat. She asked me if I was taking everything. I told her she could have all the kitchen ware, the monitor, several other items and the scanner too. Her eyes lit up and she was very grateful. She said she could really use the scanner which worked perfectly – I was just holding onto them because they were mine. Only when I began giving away the items did I really start to feel good about the whole ordeal. It really felt good to let things go. I didn’t have to force things into an already over stuffed truck, and I made someone else happy. How often do I rush to buy the latest, greatest fad or electronic fashion only to have it rendered obsolete months later? Oh, I kept some things. 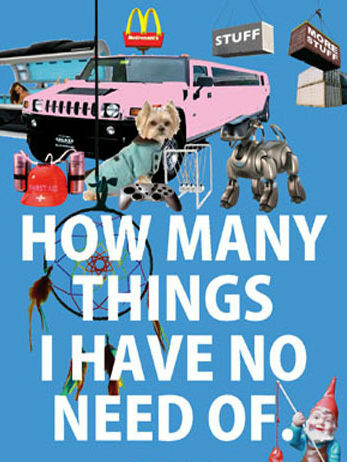 I have things given to me by parents, children and friends. Items which I hope to keep for a while. 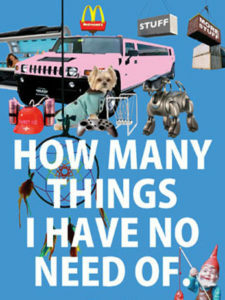 However the tenacity with which I clutch onto gadgets and trinkets needs to change. There is nothing permanent on earth. The material gifts others have given me are naught compared to the memories and love we have shared. Mom’s patience and love for writing, and Dad’s mechanical and financial management skills, those aren’t inside any boxes. Many of my material items get lost, destroyed, stolen or technically eclipsed. For the Hindu, the concept of sannyasa or renouncement is letting us know that the things of this world are not fulfilling, in and of themselves. It is not that worldly things are wrong, but that they cannot give us lasting peace and satisfaction. While I am a long way from being a Sanayasa in the literal meaning, my journey on the Dharma path has certainly helped me curtail material lusting. This lasting joy is the awareness of God within one’s self. What greater joy can there be?